Minutes’ from the M4 these comfortable and welcoming offices are based within a business centre close to Maidenhead town centre. The space benefits from all the convenience of shops, banks and public transport links just a few minutes’ away. The offices themselves are fully serviced to include business services support, meeting rooms and kitchen areas. They are available on flexible terms and come well equipped with air-conditioning and up-to-the-minute technology. Less than a five-minute walk away from Maidenhead Rail Station, this business centre is ideally placed for the commuter. There are regular services to London Paddington, which can be reached in under 45-minutes, as well as direct services to Reading. On-site, the amenities are plentiful, and include stylish meeting rooms, a management team, lift access, secure parking, IT support and access to a kitchen. 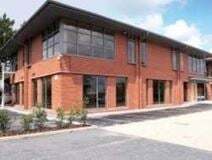 Situated around four miles west of Maidenhead town centre, this impressive business centre provides serviced office suites that have been refurbished to a high standard. There are ample, secure car parking spaces available, and 24-hour access allowing for more flexible working hours. As well as this, there are meeting rooms available, conference facilities, access to kitchen facilities, and air conditioning. This 1960's building has been recently transformed and brought up to date with glass and steel fittings, giving a light, airy, modern feel. It's location on a business park is close to Maidenhead town centre for all local services and attractions. Furze Platt station is a few minutes’ away and the accommodation benefits from on-site parking. This serviced office park is situated to the north of the centre of Maidenhead, and is easy to reach from both the M4 and M40 motorways. A wide range of office space solutions is available on very flexible terms to suit your needs. Occupying an excellent location in Maidenhead centre and within a recently modernised office building this office space is recently refurbished and offers you a high degree of flexibility. Its position provides proximity to town centre shops and eateries as well as excellent links to London and Heathrow Airport by road or rail. By road the M4, M40 and M25 are easily accessed and nearby Maidenhead station provides a direct link to London Paddington.